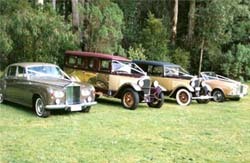 We can offer a fleet of superbly presented Classic & Vintage cars covering Melbourne Metro, the Dandenongs, Yarra Valley and the Latrobe Valley. If you choose to use our transport services on your special day, you do so with the peace of mind that comes with dealing with specialists who have been catering for Weddings and other Special Occasions for over twenty years. We can cater for Weddings, Debutante Balls, Corporate and other tourism needs.